If there’s a life-blood that courses through the veins of this country, it’s black. It always has been. I was born in the center of West Virginia, to a railroad family. After college I hitched my car to a coal miner’s daughter from Wheeling, a decaying, once glorious city where the National Road crosses the Ohio River in the far northern part of the state. Now we find ourselves in Pennsylvania, in what’s called the Coal Region. I teach at one of the myriad small private liberal arts colleges that proliferate in Pennsylvania like no other state save Massachusetts. A few miles from here there’s a modern day ghost town — a curiosity called Centralia — claimed by eminent domain, condemned, and finally abandoned by its residents because of a uncontrollable mine fire that has been burning continually under its streets for fifty years. The people here are fascinating. They have a culture all their own, a way about them that’s foreign to me even though I come from only a few hours south. Manhattan is three hours by car, but might as well be a million miles away. People here for the most part haven’t made the trip, and really don’t care to. Less easy going than folks in West Virginia, they are more gruff, not so quick to trust. The southern tendency towards public manners doesn’t extend this far north, as if the area’s hard winters somehow keep courtesy at bay. Don’t get me started on the Amish. People around here have an uneasy relationship, or rather an uncomfortable dependency, on the local colleges (every town’s got one), which since the waning of the coal industry have become the driving force behind the local economy. (Natural Gas has recently arrived like a Biblical whirlwind, but that’s another story.) Yet like West Virginians, Pennsylvanians have been defined in some way by coal. The history of the people around here and the black rock is long, very well documented, and bitter. It’s an immigrant history, an American one. It’s a story of the captains of industry, and the backs upon which this country was built. It’s a story of abuses, of resistance, of labor, of unions, and finally of progress. It has largely been forgotten. Or ignored. Yet it’s such an alluring story! Dappled as it is with secret societies and violent, sensational crimes. It’s often pure bedtime stuff, and it makes wonderful film fodder, as historians can’t seem to form any consensus as to the truth, or in some cases, even the existence of many of the historical players that populate this modern mythology. That brings us to the Molly Maguires, the subject of a 1970 film starring Sean Connery and Richard Harris. If you don’t know who the Molly Maguires are (I’ve got no perspective there, they are ingrained in the culture here) I encourage you to check out the Wikipedia article — surprisingly, it’s one of the most exhaustive (and fairest) I’ve read. In a nutshell, the Maguires were a secret society of Irish coal miners who violently resisted the working conditions in the Pennsylvania coal fields in the latter half of the nineteenth century. Events in Mollie history culminated in the 1870s, when a Pinkerton man infiltrated the group and brought about the arrests, convictions, and executions of numerous men accused of being Mollies. The film, The Molly Maguires, presents a dramatized version of these events. Sean Connery plays the ringleader of the Mollies, while Richard Harris is the detective. In many ways Martin Ritt’s film follows typical Hollywood formula — sticking to the thirties gangster film tradition: infiltration – acceptance – betrayal – outrage – revenge. Yet the movie shines in its attention to detail. Too often we take for granted the toil that went into the things we see around us. Here’s a film that provides a fair depiction of what life in a mine was like for the men who descended into that unique hell each day of their lives, until the black dust ruined them. It shows us the dirt, the sweat, the blisters, and the constantly looming ceiling of rock, always a moment from crashing down. We see everything from the cruel ritual of payday to drinking company lager and shopping at the company store, but the film manages to never preach at us. Richard Harris plays a police officer that clearly empathizes with the men he suspects of murder, and time and again the script refuses to let us know with whom his loyalty truly lies. Harris’s struggle is the dramatic thrust of the film, yet he’s not engaged enough with his part to make us truly care which way he’ll go in the end. Even Connery seems subdued, as if his efforts to create a “hard man” stifled his ability to show us what’s happening beneath the surface. Director Martin Ritt refuses to take sides, and in his effort to avoid preaching at the audience, he leaves us with a film that feels more like a detached action picture than an emotional human drama. After watching a movie with such a “can’t miss” pedigree, it isn’t surprising to see how it only scored an Oscar nomination in the set decoration category. As I watched I kept wishing for the passion of Paul Muni in 1935’s similarly themed Black Fury, everyone here just seems to be going through the motions. Such a powerful, yet unknown chapter in American history deserves better treatment than this. 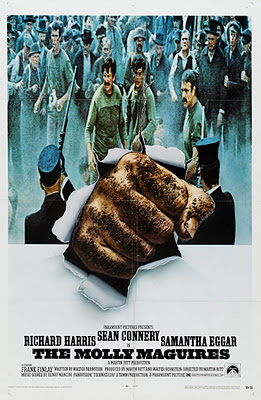 One of the nagging omissions of this film is that it never delineates just what the strategy of The Molly Maguires means to be. Just what did they hope to achieve specifically through their methods? Had we been allowed a more intimate inclusion into their mindset I think it would have been easier have a more concrete empathy for their plight. It would have also cemented our view on how to judge the ultimate moral decisions of Harris' detective, but as it stands the sense of detachment is not only within the film, but toward the film from the viewer.